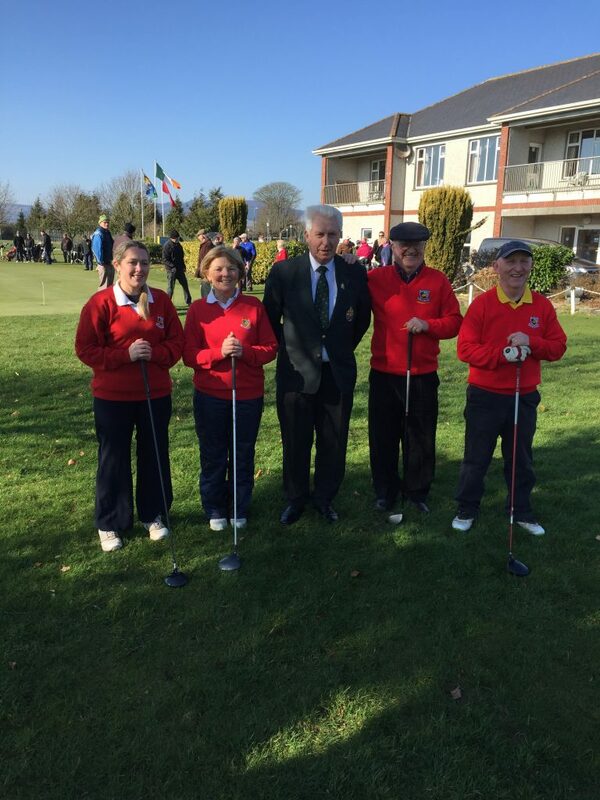 Templemore Golf Club Captains Drive-in. Sunday. 25th. Feb. 2018. L to R. Lady Captain. Sara Hearne. Lady President Bernie Stapleton. President of the G.U.I. Mr. John Moloughney. Club President, Phillip Ryan Snr. Club Captain, Tommy Foley. Captains Drive-in; It was a fantastic weather day with blue sky’s and a fantastic turn out of family members and friends of all, which made it a great community day. Captain Tommy Foley praised all involved and also his delight with the huge turnout. He gave a great motivation speech to the club in its quest for the future and congratulated all the members for supporting the club in times when there was uncertainty with its future. Lady Captain Sara Hearne thanked all the ladies for their support and looked forward to the challenge of steering the Ladies club into the future and expressed with the support of her father PJ Leahy and Uncle Liam Leahy that the challenges will be made easy to overcome. President of the Golf Union of Ireland Mr. John Moloughney congratulated both Captain Tommy Foley and Lady Captain, Sara Hearne, President Phillip Ryan and Lady President Bernie Stapleton and assured them of his full support. John gave a historic account on the evolution of Templemore Golf Club to the present day, almost 50 years, and also of the original founder members (and acknowledged that he was not one of them) and felt very proud to have evolved from the 9 hole golf club member in Templemore to the position of President of the Golf Union of Ireland. Club Captain Tommy Foley also expressed the pride and delight of the club with John’s achievement. There was great banter with lots of food supplied by the ladies and own bar service by Rody Cawley. A great and proud day for Templemore Golf Course. Condolence; The club Captain Tommy Foley on behalf of Templemore Golf Club members expressed deepest sympathy to Teddy Kennedy on the passing of his wife Mary (née Looby) peacefully at home. Sadly missed by her loving husband Teddy, son Paul, daughter Laura, brothers Liam, Jack, Dinny, Pat and Tim, aunt Biddy (Healy), brothers-in-law, sisters-in-law, nephews, nieces, relatives, neighbours and many friends. May she rest in peace. Seniors, Thursday 22nd. Feb; It was a blustery bitter cold day despite leaving the Tee off till 2pm. However, there was a great turn out. Captain Tommy Foley complemented all who braved the weather and also complemented the voluntary workers for the necessary winter work on the course. He also appealed to all to attend to a Bunker, by weeding and raking. One bunker each will be a great benefit to the appearance of the course. He also offered condolence to Teddy Kennedy on the passing of his wife Mary on Monday 19th. Seanie Gleeson offered a speedy recovery to John (The Saint) Stapleton and to Phil Ryan both on illness recovery. He also gave a great humorous and vocal commentary on the winners as follows; 1st. Team; Liam Daly, Seanie Gleeson, Tom Kennedy, John Galvin. 2nd Team; Tom McGrath, Sheamus Ryan, Ollie Murrey, Donal Golden. 3rd. Team; Mick Murphy, Pat Maher, Willie Hovery, Tony O’Toole. All is looking well for this Thursday 1st. March. LMC; At the LMC, AGM in Roscrea on Monday 19th. 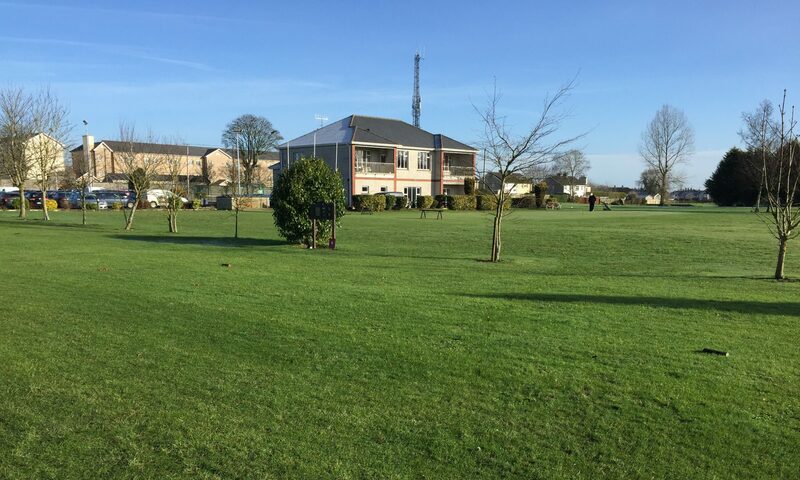 Feb. it was agreed to play Templemore Golf Course on Saturday 22nd. September 2018. The first outing will be in Portumna on April 5th. Watch this space to see Liam Daly defending his 2017 win. Munster Golf; Irish Cups and Shields Tournaments 2018 are now listed on the Club House Locker room for details. The AIG Cups and Shields National Finals will be in Thurles Golf Club on 21/23 September 2018. The Irish Mixed Foursomes National Final will be in Miltown Golf Club 5/6 October 2018.